ArmInfo. Prime Minister of Armenia Nikol Pashinyan told journalists today about the details of the meeting with the first President Levon Ter-Petrosyan. In particular, he noted that the meeting was held on the initiative of Ter-Petrosyan: "Ter-Petrosyan expressed a desire to discuss certain issues with me, and I invited him to a meeting." As the Prime Minister said, the first president wanted to give him certain information concerning the Karabakh issue. "He wanted to inform me about the information concerning the Artsakh issue, which he thought might not be known to me, it was a very useful conversation, but I already knew everything he told me," the Prime Minister said. 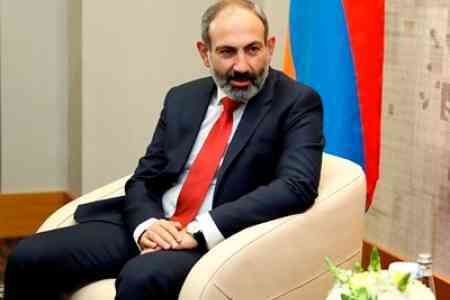 Pashinyan noted that after his election as prime minister, he first of all received detailed information on the Karabakh conflict and negotiations. "I have invited Edward Nalbandian, the former Minister of Foreign Affairs, for this purpose. I do not rule out that such a meeting may take place in the future. During the meeting with Ter-Petrosyan we did not touch upon domestic political issues," Pashinyan stressed. Asked whether the Prime Minister intends to meet with other former presidents of Armenia, Pashinyan said: "The first president expressed a desire to meet. If other former presidents express same desire, we will discuss it. At the moment I do not see the need for it, but I do not rule out the possibility that at certain moment such a need may arise, that is, I do not say - no, I will not meet with them, " Nikol Pashinyan concluded.